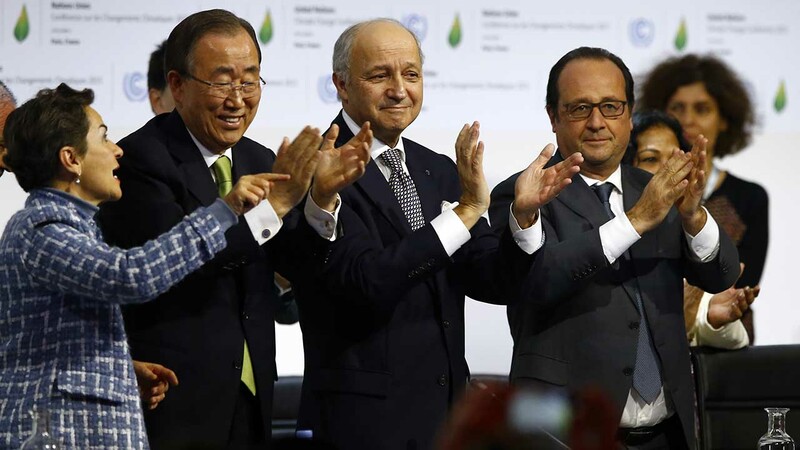 LE BOURGET, FRANCE -- Nearly 200 nations adopted the first global pact to fight climate change on Saturday, calling on the world to collectively cut and then eliminate greenhouse gas pollution but imposing no sanctions on countries that don't. The agreement, South African Environment Minister Edna Molewa said, "can map a turning point to a better and safer world." "This is huge," tweeted U.S. President Barack Obama. "Almost every country in the world just signed on to the #ParisAgreement on climate change - thanks to American leadership." The deal now needs to be ratified by individual governments - at least 55 countries representing at least 55 percent of global emissions - and would take effect in 2020. It is the first pact to ask all countries to join the fight against global warming, representing a sea change in U.N. talks that previously required only wealthy nations to reduce their emissions. More than 180 countries have already presented plans to limit greenhouse gas emissions- a breakthrough in itself after years of stalemate. But those pledges are not enough to achieve the goals in the accord, meaning countries will need to cut much more to meet the goal. The agreement sets a goal of getting global greenhouse gas emissions to start falling "as soon as possible"; they have been generally rising since the industrial revolution. In what would be a victory for small island nations, the agreement includes a section highlighting the losses they expect to incur from climate-related disasters that it's too late to adapt to. However, a footnote specifies that it "does not involve or provide any basis for any liability or compensation" - a key U.S. demand because it would let the Obama administration sign on to the deal without going through the Republican-led Senate. The adoption of the agreement was held up for nearly two hours as the United States tried - successfully, in the end - to change the wording on emissions targets. The draft agreement had said developed countries "shall" commit to reducing emissions; in adopting the pact organizers changed the language to say those countries "should" make that commitment. Experts said the deal probably won't need congressional approval. "Today the human race has joined in a common cause, but it's what happens after this conference that really matters," he said. "This deal alone won't dig us out the hole we're in, but it makes the sides less steep." That's because when emissions fall, nature compensates by absorbing less carbon dioxide - and can even release old pollution once there's less of it in the air, said Princeton University's Michael Oppenheimer. Forests, oceans and soil currently absorb about half the world's man-made carbon dioxide emissions.